The members of Team Two and a Half Men, all met each other at the 2007 150-mile stage race, the Gobi March. Most people would be thrilled to get in one of these trips during a lifetime, but these guys make a habit of it, and believe that life is for living now, and not put it off for the unknown future, and they live by the motto “If it were easy, everybody would be doing it.” After this successful expedition, it leaves only two more for the “triple crown”…the South Pole and the summit of Mt. Everest!! Doug Stoup is honored to guide these three athletes to successfully achieve their polar dreams. 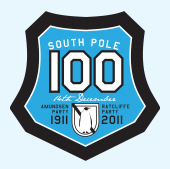 South Pole 100 is an expedition to complete the unfinished journey of Ernest Shackleton’s 1909 route to the Pole. Polar Guide Doug Stoup will guide the team 112 statute miles to the Geographic South Pole. The aim of the expedition is to arrive on the 14th of December 2011, the 100th anniversary of Roald Amundsen’s arrival. Amundsen was first person ever recorded to reach the South Pole; he and his party arrived on December 14, 1911. In November 2010, Doug Stoup lead an intimate sailing adventure to the Antarctic Peninsula upon the Yacht Australis. This 23-day adventure set off from Ushuia, at the southern tip of Argentina, and headed across the Drake Passage for a series of stops on the remote Antarctic Peninsula. Doug and the crew visited penguin rookeries, stopped for multiple ski objectives, and explored the area in depth using Zodiac watercraft. On April 11 2010, Doug Stoup, Dennis Garcia and Jack Ashton will begin their expedition to the North Pole as part of a trek for peace. For Dennis, this adventure will complete his goal to walk to both the North and South Poles, a challenge only accomplished by an exclusive group of less than 100 adventurers on the planet. Jack will be using this year’s expedition as training for a more ambitious expedition he has planned for February 2011; a 600 mile trip from Ward Hunt Island, Canada to the Geographic North Pole. This will be Doug’s 10th expedition to the Geographic North Pole. Please join the Ice Axe Team on a trip of a lifetime to the Antarctic Peninsula. 107 adventurers including some of the world greatest ski & snowboard extreme athletes, film crews, writers, scientists & wildlife enthusiasts are heading to Ushuaia, Argentina. They will then travel across the Drake Passage, the roughest water in the world until their ship reaches the Antarctic Peninsula to begin what is sure to become an epic journey. You are invited to follow the adventure through our blogs, photos, audio and video posts that will be updated daily. So log on and join in! Its sure to be a wild ride! 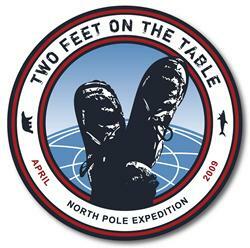 The TWO FEET ON THE TABLE expedition is an expedition to reach the Geographic North Pole by foot this April. Members of the expedition are raising funds for the Aqualung Trust, The Motor Neurone Disease Association, and The Naomi House Children’s Hospice. Follow adventurers Doug Stoup and Michael Mitten as they travel to the North Pole April 2009. Since losing his father in June 2007, Michael Mitten has wanted to do something extraordinary for Macmillan Cancer Support to ensure that they have the funding to continue to make a difference to the lives of cancer patients. With the True North Expedition, Michael hopes to raise £50,000 for their efforts. Doug guided Baffin’s, Paul Hubner and his sons Brent and Mark to the Geographic North Pole. Doug also carried the Olympic Torch and planted the U.N. flag in support of Milennium Development Goals. Doug Stoup and Richard Dunwoody arrived at the South Pole on January 18, 2008 at 10:23 GMT. They trekked nearly 1,100 kilometers over 48 days to establish a new route based on the original course planned by Ernest Shackleton. Despite injuries and exhaustion they reached the pole ahead of schedule. The team reached GPS 89.599°N (the Geographic North Pole) on April 26 just before midnight GMT. They had to traverse numerous pressure ridges and leads (open water), as well as battle the fast-moving, drifting ice. They were flown to ice station Borneo after a night on the top of the world, and connected with their flights home via Longyearbyen. ICE AXE recently concluded an internet documentary, webcast from the Amazon river and rain forest in Brazil. Each day, Doug Stoup and fellow team members sent photos, audio, video and text; and also answered questions from students. The team of Doug Stoup, John Griber, Glenn Poulsen and Ryan Sutter climbed Cerro Aconcagua via the ‘Polish Glacier Traverse’ route. Unfortunately, their repeated summit attempts were thwarted by high winds and extremely cold temperatures. The North Face team of John Griber, Hilaree Nelson O’Neill, Kasha Rigby and Willie Benegas climb, ski and snowboard Cho Oyu. A WWF-sponsored team of three explorers sets out to walk to the North Pole. Despite logistical problems and ‘attacks’ by a polar bear, they manage to plant satellite beacons that prove instrumental for completing the scientific model of Arctic Ocean ice melt. Doug Stoup, Marc Cornelissen, Petter Nyquist and team skied to the geographic North Pole. Mike Libecki and Josh Helling ventured the remote region of Queen Maud Land, Antarctica to climb, explore, ski and make repairs to a Stanford weather station for NASA. Ama Dablam 6865m (22,493 ft.) is located in Nepal in the Everest region (Khumbu). Translated, the name means ‘Mother and her Necklace.’ Doug Stoup, John Griber, Mike Kessler and an American team climbed to the summit. Snowboarder John Griber, telemark skier/climber Kasha Rigby, snowboarder/climber, Jim Zellers, and skier/photographer Chris Figenshau sought out aesthetic first descents in the remote Karalae Glacier region of East Greenland. Using splitboards and towing sleds, they will traveled from Tasiilaq to the Karalae Glacier. The team used kites to access their objective peaks. Doug Stoup and Andrew McLean travel to one of the most emote places on earth — Anvers Island, Antarctica. Doug Stoup takes the first step in preparing for an epic adventure to become the first person to bike to the South Pole. Best invention for 2003 by TIME Magazine. Douglas Stoup’s 62 day expedition (730 miles) to the Geographic South Pole.